The first Newfoundland to reach Australia arrived with the First Fleet, on the Scarborough – his name was Hector and he was owned by the ship's master, John Marshall. When the ship sailed for home again, the dog was left in Australia. When the Scarborough returned two years later with the Second Fleet, Hector is said to have swum out to meet the ship and welcome his master. Newfoundlands have a very powerful water rescue instinct and were also used to rescue people and retrieve cargo lost overboard from ships – these dogs have well-developed webbing between their toes to assist in swimming. Newfoundlands can live to ten years of age. Newfoundlands love people and worship their family members. They are placid, loyal and trustworthy. Their playmate and nursemaid qualities are second to none. Most people believe that a dog as large as a Newfoundland will eat you out of house and home. 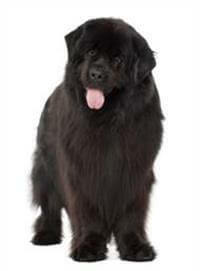 Not so – adult Newfoundlands will only eat as much as dogs the size of a German Shepherd. Big dogs with a moderately long outer coat and a thick undercoat, Newfoundlands look their most glamorous in the winter. While regular brushing is required, and ears and feet need trimming, most do not require hours of grooming and work to keep them looking and feeling their best. Although Newfoundlands are not difficult to groom, be warned that dog hair will become a fact of life! Families. These dogs are suitable for both children and older folk, although they can be a little on the boisterous side.